Since 1941, the Social Security Administration (SSA) has periodically surveyed the aged to determine their economic status. The first national survey was conducted in 1963. In 1976, SSA's Office of Research and Statistics began compiling a biennial series of reports on the income of the aged based on data collected by the U.S. Census Bureau in its Current Population Survey. 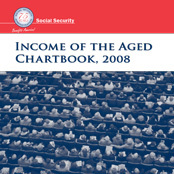 These SSA reports are published under the title Income of the Population 55 or Older. The most recent edition of that publication is based on 2008 data, which, along with special tabulations, form the basis of this chartbook. This publication covers the population aged 65 or older. The unit of analysis here, with the exception of measures of poverty and family income of persons, is the aged unit, which is a married couple living together or a person who does not live with a spouse. A married couple's age is defined as the age of the husband—unless he is under age 55 and the wife is 55 or older, in which case it is the age of the wife. The race and Hispanic origin of a married couple are determined by the husband. The unit of analysis for poverty is persons aged 65 or older. The 2008 sample represented 11,844,000 couples and 17,077,000 single units. The single unit may be a widow(er), a divorced or separated person, a legally married person who does not live with a spouse, or a person who never married. This unit of analysis allows one to measure the economic status of the entire noninstitutionalized aged population separately from that of the family or household in which the unit may live. Lynn Fisher and Brad Trenkamp prepared this chartbook. Staff of the Division of Information Resources edited the report and prepared it for publication.